ERGOBaby Organic Carrier for $115.95, Shipped! It's really tough to find ERGOBaby carriers on sale, and it's really rare to see the organic carriers at a discount! Sign up for or log into Gilt and click on the Baby & Kids link across the top of the page. Visit the Top Gear: Inglesina, Perry Mackin & More sale and you'll find a nice variety of brands on sale. 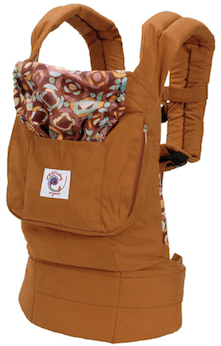 One notable item that's in the sale is the ERGOBaby Desert Bloom Organic Carrier for $110! Regular retail price is $145, and the lowest price on Amazon is still $135. Shipping for the carrier is $5.95, so your total price will be $115.95. That's still a great savings on this highly-rated organic carrier!